Craig here again. I wrote a pretty popular post about suspense a month or so ago. It seems to me that you guys like craft posts, so I’m piggybacking that success with a post about tension. People, just like you and I, live pretty normal lives. Sure, we deal with tension, and in my case hypertension, but it’s all pretty mundane. We read to escape the normal world. I write across science fiction, fantasy, and paranormal genres, but I’m not talking that kind of escapism. (Not today, at least.) When we read, we want to get a bigger picture, something where the stakes matter. Many authors fall in love with their fictional characters. Because of this, nothing ever happens to stress them out. This is not the kind of escape people want to read about. They want to know that someone faced bigger odds than they ever have and succeeded. Fiction isn’t the real world, even if you’re writing something outside my genres. You still need tension even in an historical piece, or a quirky romance. I think we’re all born with an idea that tension makes for better stories. We simply train ourselves away from this, because we don’t like dealing with it ourselves. Think about your own children. I raised two sons and a daughter. I also have two granddaughters, and a grandson. The toys I have for an example are Barbies right now. You can substitute Ninja Turtles, GI-Joes, or whatever fits your surroundings. I’m going with Barbie. Barbie has everything. Selling Barbie is different than selling books, so we need to acknowledge that to make my point. Barbie is only the beginning for parental spending. Soon you need a jet, a camper, a meth lab, whatever else they offer. This works because Barbie is boring. She has no tension in her life, and kids turn to fresh distractions. As an author, I can’t use that business model. Oh sure, I could order a million Lisa Burton lunchboxes, and some plastic GTOs for Clovis. (A couple of my original characters.) But nobody is ever going to buy them. At least not until Hollywood discovers them. My business model is to sell the next book, based upon the quality of the one you just read. This means suspense, action, and yes tension. Barbie loses her head. This is because without all the fluff, the story ceases being fun without tension. Bet she’s feeling tension now. Even children get it. Barbie kisses Ken for the 10,000th time is boring. Will Barbie still love Ken after he lost an arm is a better story. Strip away all the jet setting and ask yourself if your story has enough tension. Make your characters deal with crap, and not just the big stuff. Readers will relate to it. Make your heroine stay late because the copier refused to work. Maybe her date got tired of waiting and left the restaurant. Tension. You can reward her later by having the hunky copier guy moonlighting as the bartender. Make your superhero step in dog poo. Let some kid spill a milkshake down his cape before he meets with the Mayor. Add a little tension. Completely change up the big business presentation at the last minute. Your character can still walk in and nail it, but the tension makes it interesting. It adds stress that makes him real. Tension can also be suspense, but it doesn’t have to be. A diver’s air meter indicating empty is suspenseful and tense. The dog poo up the page isn’t suspenseful, but it adds a different quality to Judge Judy’s day. Sometimes a hangnail is an annoyance, but what if you’re a Major League Baseball pitcher, and every throw costs $10,000? Remember the drone incident from the 2016 World Series? Think about your scenes and add a little tension to them, and don’t forget the small things. It keeps fictional life interesting. Horses throw shoes on occasion, people have to fly on standby, grandma’s vase gets broken, it’s realistic. It will make your characters more believable, and prevent your next book from being treated like Barbie’s head. Let me hear from you in the comments. Have you found unique ways to keep your characters uncomfortable, and tense? This is a useful article! Sometimes, we like to keep the tension out of our day, but in stories, we need it to make it great! Great advice, Craig! All excellent points to ponder — and incorporate, my friend! Really useful post on adding tension into your writing. Falling in love with your character — now there’s a pitfall I can relate to. You’re right, if you get too fond of him or her, it’s pretty hard to create much realistic tension, like stepping in dog poo, because you don’t want your darling to do something that ordinary and disgusting. You don’t want them to be caught picking their noses or scratching their crotch, either. (And let’s face it — heroes who do stuff like this need a lot of positive attributes to balance these quirks). One mistake is to say, “OK, tension. Let’s put him through the wringer.” So you throw all kinds of obstacles their way — floods, fires, snakes, etc. But they vanquish them too easily, because hey, this is your precious character. Not realistic at all. I remember getting steamed in a critique group because one of the members compared my main character (of whom I was very fond) to Doc Savage, because of the way he sailed through ordeals. Definitely something to keep in mind. Tension is important in the small parts, like the spilled milkshake, and in big parts, like trying to save the day with a leg-full of cobra venom. Of course we want our heroes to prevail, but it should demonstrate some quality our readers would like to rise to. It’s possible that Gandalf could have made Frodo’s journey much easier, but he had to run off and meet with his publicist or something. I never had a Barbie and had no idea how hollow/shallow she was. I hope Mattel realize their mistake(s) concerning her and Ken. Talk about a misconception taught to young girls. It really is, but they sell a billion of them. This I know from the numbers my granddaughter had accumulated. I’m especially intrigued as to whether Barbie will love Ken when he’s an arm short, and furthermore, I am always screaming and swearing at the printer, and NOT ONCE has any sorta beefcake come in to rescue me! You get it. I don’t know about poor Ken, Barbie seems pretty shallow to me. Tension, like a good tug o-war! That’ll do it! Super post, Craig. I need to try to become a little better at the tension thing. I think the Barbie example is a great one. Pretty bland stuff until Ken decides he is a transvestite goth. Barbie is totally unnerved since she realizes he is better looking than she and has cooler clothes. Another example of what happens when Barbie is boring. A writer can easily go overboard, but a bit of reality here and there can make it all more relatable. Or buy serial killer Barbie and let her loose on society. Or Autopsy Barbie. Now there’s a chick who can wreak havoc. LOL Fun post! I saw those on your Facebook site. At least those Barbies aren’t boring. More than one commenter wants Barbie to have a meth lab. Probably because her life is boring. I followed it. I try to create tension both in characters’ inner lives and in the world around them. I think that the key of achieving tension is that the conflict has to be the most important thing in the world to my characters. Thank you for another useful post! I bookmarked the page. Thanks, Carmen. Hope it offered something worthy of bookmarking. Another excellent post, Craig. Right now, I have plenty of tension in my life … like developing a phobia against making drinks. That’s a whole story, and just the kind of small thing that can get added to a narrative to increase tension. You know, one of those days where the hero/heroine feels like they should never have gotten out of bed. … Four times in a row, now, disaster has struck while making drinks. First, the coffee maker pierced the pod in the wrong place, and coffee grounds went everywhere, and I mean everywhere! Next, the milk sprayed out of the lid of a supposedly sealed carton when shook … yay, milk shower 🙂 Then, as if all that wasn’t enough, the stirring spoon stuck to the plate it rests on, causing a spill from the (finally, at long last) full cup. The rest of the day seemed to show things settling down until … opening a soft drink that evening. OMG. Explosion time, lmao! Suffice it to say, I ended up wearing a wet dress, got sticky hair, and had a lot of kitchen clean up. My new plan? Making drinks over the sink, ha ha ha. I need to go read a good book with plenty of tension to take my mind off all this! Happy reading/writing everyone 🙂 … Oh, yeah, can I borrow your dog, Julie?!?! And that’s the moment when the love interest should be introduced in your story. It’s real life stuff, and makes our characters relatable. Glad you liked it. Great post, Craig! And good reminder that little things can cause tension just as much as big things. Small stuff can build up to make big stuff later on worse. Just like those days when everything goes wrong–and you don’t even have your dog around to complain to–and the vet calls to tell you he knows why your dog is sick: he’s got a belly full of Barbie heads. Barbie’s head as a plant and payoff, I like it. When we write, we have to limit the amount of this stuff, but readers will relate to someone who isn’t perfect. Excellent post! Minor tensions, like breaking a nail or two before a big interview, are things real people can relate to. They bring the reader inside. I bit my nails and my older sister used to dig her nails into my flesh. I couldn’t fight back, except to pull her hair. So I pulled the heads off all her Barbies or cut their hair. I loathed Barbie. Sister finally started leaving me alone when, at eleven years old, I bashed her with the bunk bed ladder. Once she realized I could pick up a weapon, things got real. Wonder why it took me eleven years to figure that out? Those little things help make it realistic. We choose between what might put our character off her game. Now the ladder image has me thinking of an old Jackie Chan movie where he fought using a ladder. They never seem to release dioramas that give Barbie any tense moments. Maybe they should make a hockey mask for Ken. Seems to me the whole point of Barbie is to make her perfect, which can be done only by buying her all the outfits and accessories. The only excitement about her is getting the next new thing. Another great post, Craig. Just as with suspense, I’m a huge fan of tension in writing (and reading). As a reader, I often find atmosphere and setting to be one of the strongest elements a writer can use to craft tension. I love those moments of build up when I know something is going to happen, but it hasn’t happened yet. In a movie theater, I’d be shrinking down in my seat, waiting for the “shock” moment. In a book, I find myself tensing my muscles as I read. Barbie never lost her head!!! Were you one of those kids who’s room was always clean too? Kidding aside, some writers tend to write sparkly characters who live perfect lives, and the work suffers because of it. Make the character suffer and not the reader. I’m with you on that! Flawed characters are the best. And, hmmm, looking back, my room was pretty clean, LOL! Tension is a must for any story. Will the good guy win? Will light prevail over evil? Our readers want to “feel” tension, conflict and then watch resolution unfold. Great post, Craig! I’m a huge fan of tension in stories, but who among us isn’t? You hit the nail on the head (not that Barbie still has hers, lol) when you said we’re all predisposed to tension making for better stories even as we shy away from it in our own lives. I don’t know about you, but I hate conflict and tension in my own life and strive for calm as often as I can get it. But that’s why I love fiction so much. I don’t want to ride a cyclone to a foreign land and battle witches and flying monkeys before I figure out how to get home. I just want to stay at home safely. But I’d LOVE to read about that happening to someone else. You summed it up pretty well. We want to read about someone else’s lousy day, and know they faced huge odds before triumphing in the end. We want to believe this can happen and have faith for ourselves. Hey gang, I’m posting over at Story Empire today. The topic is adding tension to our stories. Drop in and join the discussion. This has to be the best line of the post because it’s so true. I look at it as fiction having to be similar to real life in that stress/tension should exist. That’s where conflict can steam from too. I’m a big fan of having the hero stumble or get hit by at least one setback because it doesn’t feel believable if things run too smoothly. Foreshadowing is a useful tension tool. My personal favorite is setting descriptions where you hit on the senses and deliver a tense atmosphere before delivering an event. I’ve done that too. Using weather or sundown to set the mood. I wrote a section in an unpublishable story years ago about a sniper. When it came down to the shot, the guy had to move his bowels so bad he couldn’t hold still. Dumb, but that’s more real life. Wonder what they do to counter that. I would think it’s a problem that’s come up once or twice. Dunno, when you’ve gotta go, you gotta go. Good post, Craig. Sometimes it’s hard to forget the “little” things. It doesn’t have to be a scene where the protagonist is confronted by a murderer to cause tension in a story. I believe the little things can make for great fiction. It doesn’t take much, but is worth a second thought. 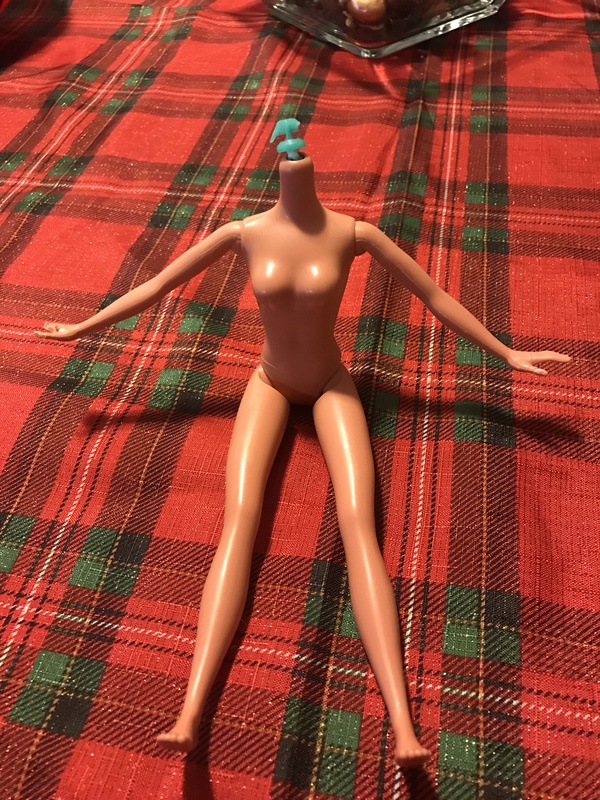 Barbie loses her head. This made me laugh out loud. We have toothbrush timers that keep mysteriously losing the timer. It’s probably just Beany investigating how the attachment to the arm of the teddy/owl works etc but imagine if it’s because she wants to explore a word without time! Great post Craig. Maybe it’s because tooth brushing is boring. She’s adding tension. I can add as much tension as she likes, she’s still brushing her teeth!!!!! Looks like I added tension to your life. It’s good to assess on one of the editing passes.